If you’re in the mood for fresh air, natural beauty and a leisurely stroll, try a walking tour of the Farm. 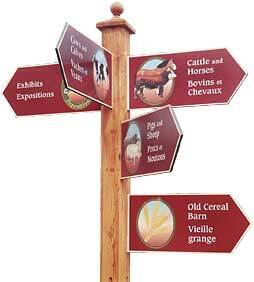 The Canada Agriculture and Food Museum is a good place to start your tour. For a modest entrance fee, you can visit this unique combination of modern working farm and museum. After you have visited the Museum, walk north on Maple Drive to see the Tropical Greenhouse. It is open Monday to Friday, 9 am to 4 pm; Sunday 10 am to 4 pm; and closed Saturday. Continue north past the tennis courts to the old hedge collection between Maple and Birch Drives, with some hedges dating from 1891. Turn south on Birch Drive and cross the Driveway to the Ornamental Gardens. Walk through the Macoun sunken garden, the rose garden, the rock garden, the perennial garden, the new explorer rose garden, the new hedge collection, and the annual beds. Walk back to the Driveway and cross Prince of Wales Drive (carefully) and enter the Arboretum. 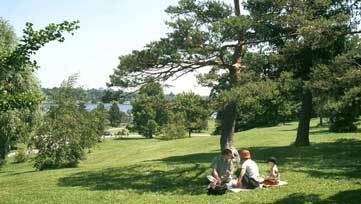 From the lookout points, you can see the Rideau Canal, Carleton University, Dow’s Lake and the surrounding city. From the Arboretum, head west again to your point of departure. Excluding your time at the Museum, the walk will take about an hour and a half.